This post is sponsored by PMD. My thoughts and opinions expressed here are my own. Thank you for supporting brands I support. I mentioned in my 2018 goals that taking care of my skin is high on my list. I always had issues with my skin and never did much about it. With all the toxins my body went through from cancer treatments, and because of just getting older, my skin definitely needs more attention. In late 2017, I started to pay closer attention to my skin and really gave it the love it needs. During Fall 2017, I started using PMD Personal Microderm. Personal Microderm is a handheld device that is used to exfoliate away the dead skin and dull cells on the surface of the skin. By removing the dead skin, it allows new skin to generate and reveal a more soft and rejuvenated skin. If you have been watching my InstaStory, you may have noticed that I have small blotches on my skin. A lot are just spots from acne scars throughout the years. The only way I can successfully minimize these acne scars is to go into a salon and get the facial treatment. I really enjoy getting facials, but to fully see the benefits you have to consistently go until all spots are removed. I probably only go about once every two years. The only time I go is when my mom asks me to go with her. We all know the key to anything being successful is to do it consistently. Well, unfortunately I can’t go consistently due to time and money. Going in for a facial can take one to two hours. 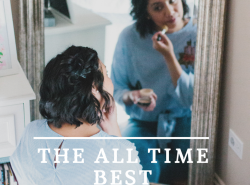 From working full time, running a blog, going in to the hospital for treatments, and having doctor appointments in between, I just don’t always have the luxury of time. Plus, it can be costly. One facial treatment can go up to $300. I just can’t see myself spending that much every 6-8 weeks. I’m on a budget! How Can PMD Personal Microderm Help? PMD Personal Microderm works your skin the same as going to the spa. However, the process doesn’t take an hour or two. 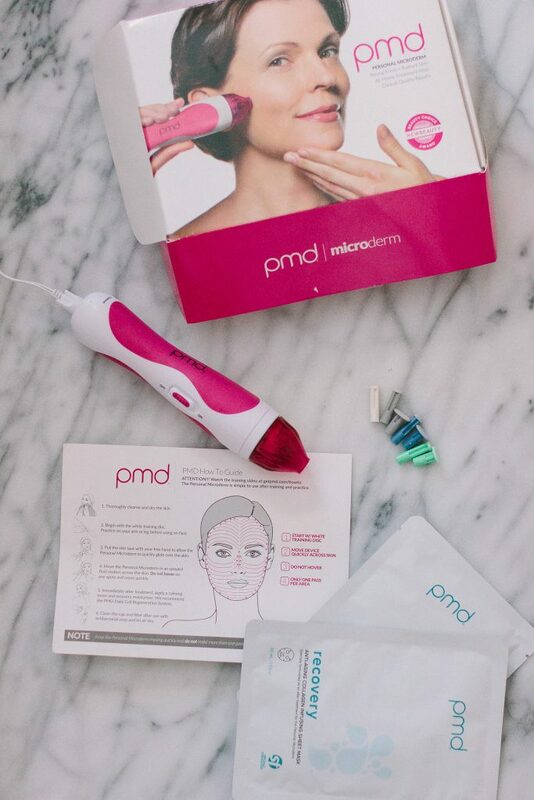 Using the PMD Personal Microderm takes about 3 minutes for the entire face. I will admit the first time I did it, I was a little bit slower just so I am careful, but after that, it was easy! 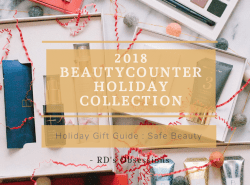 I was able to fit it in my nighttime skincare routine easily! And you only need to use this device once a week. Such a timesaver compared to the salon! 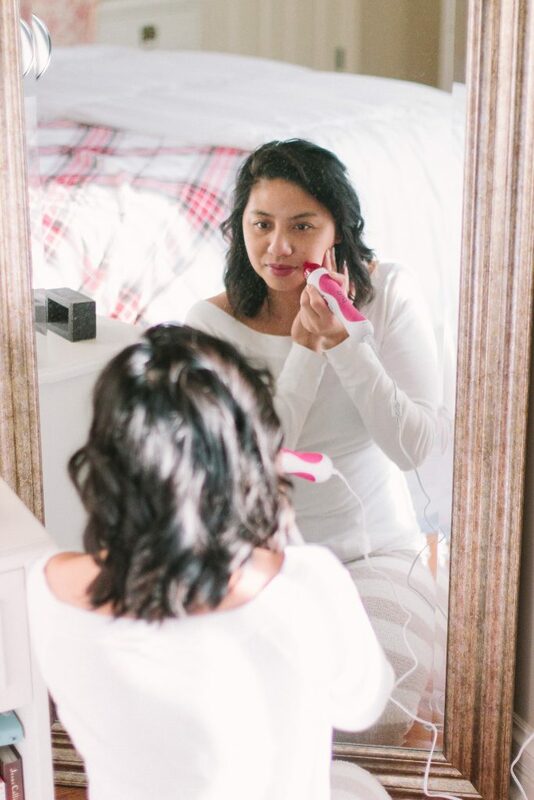 The PMD Personal Microderm may sound costly at first, but when you break down the cost per use (especially compared to going to a spa for treatment) it is exceptionally cheaper. The Personal Microderm costs $159 (I use the Classic – it is the pink one). That cost is relatively affordable compared to the cost of going into one facial treatment already. 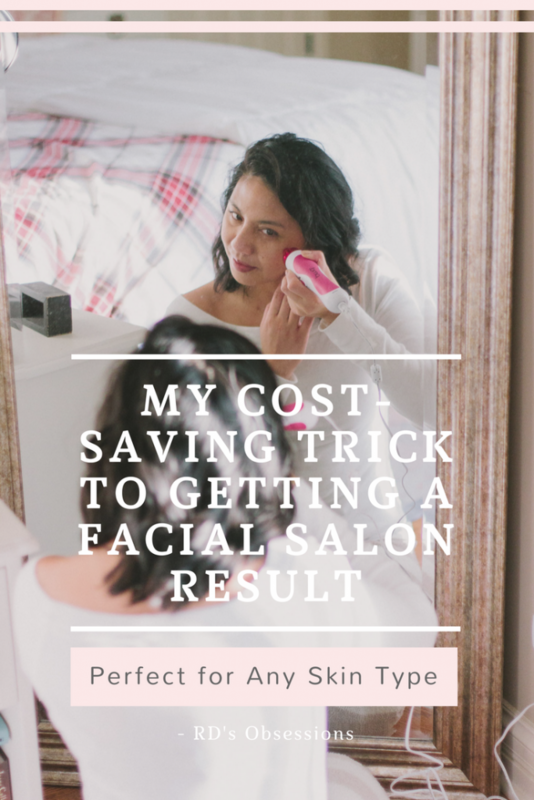 I’m sure the cost of going in for a facial may differ depending on where you live, but in Chicago, the price of places where I find the best results costs more than the Personal Microderm. I will admit, it did take me longer than most people to see the results. I’ve heard others say as early as the first week they noticed a different. It actually took me almost a couple months. I don’t know if my skin just needed a lot of work (haha! ), or my skin just took longer to generate the new skin. Not sure, but I was glad I kept using the Personal Microderm every week. The only thing I regret is not taking a before & after to share with you all! I do think I still need to continue using it. I still have spots (as you can tell in my most current InstaStory) that are still visible. But at least this is an improvement compared to a few months ago. The process didn’t hurt at all! You feel a little suction, but that’s it! I started off using the white disc (the lowest grade and meant for ultra sensitive skin). But after three uses, I moved up to the blue disc (made for sensitive skin). I may consider moving up one more to the green disc (moderate skin). After using the Personal Microderm, I used the Recovery Anti-Aging Collagen Sheet Mask. This sheet mask helps rehydrate and soothe the skin. It is also known to minimize the appearance of fine lines and dark spots. If you are curious how to use the PMD Personal Microderm, check out their ‘How-To‘ and ‘FAQ‘ sections. And this section is a breakdown of how the PMD Personal Microderm works on your skin. Have you used the PMD Personal Microderm before? If so, what did you think of it? How long did it take for you to see the results? Looks like a great product! Love this post! Oh I love this! I’ve heard of these…and was curious how well they work! Let me know if you end up trying it out! I’m so weak for face product gizmos! I want to try this. Haha me too! Let me know if you end up trying this out! I’ve heard so much about these personal ones, but haven’t seen a good, full review. Thanks for this post, it really sounds worth it! Can’t wait to check one of these out. PS your skin does look incredible!! Thank you Mandy! Glad it was helpful! Let me know if you try it out! This device sounds great, I need to try it! Thanks for sharing! I never heard of PMD before! I’m all about a great skin care routine so I will be sure check them out!! Yes, I definitely think you will love it Vanessa! Sounds amazing! I love this! You look so pretty and flawless, Rachel. Thanks for sharing it! Oh wow! That definitely sounds like the way to go. I had not heard of this, but to have access to a good product in the convenience of your own home sounds like a win win. Thank you for sharing. It really is a win-win. Hope you found this helpful Annette! So I got one of these a few years ago — maybe 4 years. But I don’t think I knew how to use it correctly because I used it once, wasn’t satisfied with the results and never used it again, lol. Maybe I should give it another go. That’s how I initially felt too! But I kept trying weak after weak until I finally noticed something. Maybe give it a try this time around and hopefully you will see results! It really is! For me it was slower than others, but glad I started seeing improvements! I love my PMD! I have to be careful not to overdo it and hurt my skin! Oh no! That is tricky! This is such an interesting product. My skin is bad too because I’ve been too lazy to take care of it, being pregnant and then a new mom. But if a couple minutes a day could save me hours every couple weeks to get a facial and $300 each time, then I’d definitely try it! Is your skin sensitive, do you know if this works for sensitive skin? Definitely a time saver and yes my skin is super sensitive and it was able to tolerate it. They have different disc and the lowest grade is the ultra sensitive. They do recommend you try it on your arm to see if you can tolerate the suction before putting it on your face. Hi Lily! Yes this works for sensitive skin. 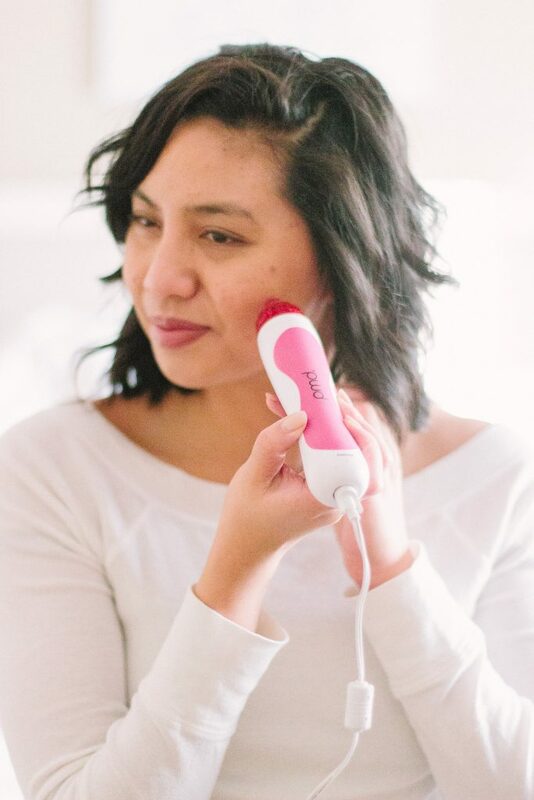 We actually have a device made specifically for sensitive skin that has a slower speed, the PMD Personal Microderm Pro! All products are 25% off on our website right now. Ooh I definitely want to try this! Oh I’ve seen a few people talk about this! I am glad that you were able to see some results, I may invest in this product so I can get rid of dead skin. I was glad to finally see results too. I wish it was much sooner LOL but it is better than nothing! I love trying product like this at home. It sounds amazing and your skin is glowing! I also have a few acne scars here and there, but I’m still paying they will eventually fade away with constant water drinking and a good skin regiment…we shall see. I’ve heard that does the trick too! I’ve been drinking lots of working, so I am hoping that is contributing! It is such an awesome tool! Definitely a beauty must-have! Linda tu sigue con el tratamiento, hay a personas que les tarda menos que a otras ver los resultados de lo que hagan (pasa con todo, ej. el gym, hay gente que va y ven resultados al mes y yo necesito minímo 6 jajajaja). En fin, que me alegro de que te ayude este producto. That is true! I’m glad I finally saw results! Thank you! Glad you enjoyed it! Let me know if you do try it out! Oo sounds like the personal microderm is right up your alley! How interesting. I’ve done a few facials in my lifetime and would love to have this tool at home. Would save so much money! It is definitely a time and money saver! Ohhh, I have to try this! That sounds amazing!! I definitely need to try it! I’ve been seriously considering purchasing PMD for myself. I have such terrible adult acne and hyperpigmentation, and I would do anything to at least decrease the redness and texture. I’ve heard such wonderful things that I’d really love to try it out for myself. Thanks for sharing your experience and review! Let me know if you do end up getting it! Don’t be discourage if you don’t see results right away. I almost gave up! We definitely suggest trying the Personal Microderm. It works wonders with hyper-pigmentation, skin texture and skin texture and tone. 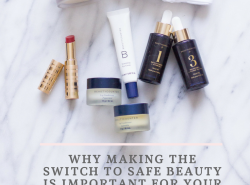 And one of the benefits of using it is that by removing that top layer of dead, dull skin, your skincare products (moisturizers, serums, acne medications) can penetrate 20x deeper and be far more effective- so that could help with adult acne as well. Our entire site is 25% of right now! This system sounds awesome, I will have to check out this tool! I have always been curious about using this! Thanks for sharing! What an amazing product! I love skincare and this looks like the perfect skin pick-me-up! It really is amazing! If you do try it out, I’d love to hear your thoughts on it! I am all about cost saving and this sounds just as good as the spa! Definitely need to try for myself. For sure it is cost saving!! I’ve heard a couple of blogs about this product, and from I’ve read, it’s actually really good. I might try this one myself soon. Thank for the reminder dear! It is really good! I definitely think it is something you would like Jessica!